This Return on Capital Employed (ROCE) template will help you calculate the profitability ratio used to measure how efficiently a company is using its capital. What is Return on Capital Employed? 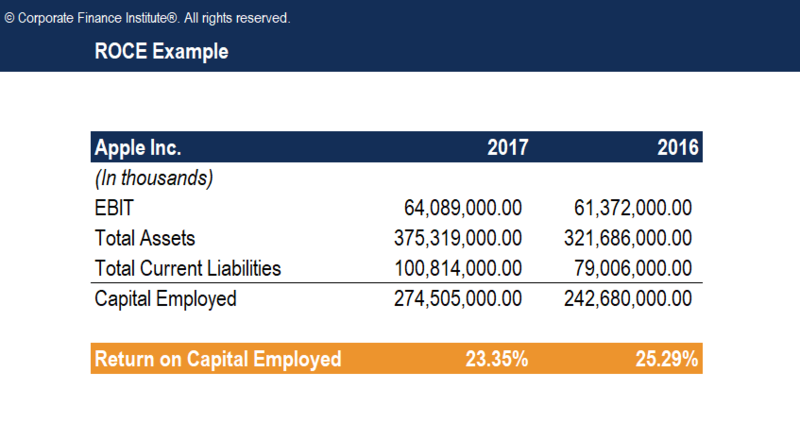 Return on Capital Employed (ROCE), a profitability ratio, measures how efficiently a company is using its capitalCapital StructureCapital Structure refers to the amount of debt and/or equity employed by a firm to fund its operations and finance its assets. The structure is typically expressed as a debt-to-equity or debt-to-capital ratio. Debt and equity capital are used to fund a business’ operations, capital expenditures, acquisitions,. Simply put, ROCE measures how well a company is using its capital to generate profits. The return on capital employed is considered one of the best profitability ratiosProfitability RatiosProfitability ratios are financial metrics used by analysts and investors to measure and evaluate the ability of a company to generate income (profit) relative to revenue, balance sheet assets, operating costs, and shareholders' equity during a specific period of time. They show how well a company utilizes its assets and is commonly used by investors to determine whether a company is suitable to invest in or not. A higher ROCE is always more favorable as it implies that more profits are generated per dollar of capital employed. However, as with any other financial ratios, calculating just the ROCE of a company is not enough. Other profitability ratios such as return on assetsReturn on Assets & ROA FormulaReturn on assets (ROA), a form of return on investment, measures the profitability of a business in relation to its total assets. The ROA formula is used to indicate how well a company is performing by comparing the profit it's generating to the capital it's invested in assets. The higher the return, the more, return on invested capital, and return on equityReturn on Equity (ROE)Return on Equity (ROE) is a measure of a company’s profitability that takes a company’s annual return (net income) divided by the value of its total shareholders' equity (i.e. 12%). ROE combines the income statement and the balance sheet as the net income or profit is compared to the shareholders’ equity. should be used in conjunction with ROCE to determine whether a company is truly profitable or not.